We are proud to use professional and audiophile equipment produced by VPI, Esoteric Sound, Shure, Sumiko, Lynx, PS Audio, HHB, Audioquest, Sennheiser, Nakamichi, Voxengo, Algorithmix, and Steinberg. The LynxTWO (US) professional digital audio system provides the hardware for our digital processing. The VPI SDS (Synchronous Drive System) is used with our 33/45 turntables to provide clean and stable power. The SDS provides turntable speed adjustment through its variable output frequency to within 1/100 hertz. All turntable speeds are calibrated with the KAB Optical Mat and Strobe to within 99.99% of the speed at which your recording was originally mastered. Our main 33/45-rpm recording turntable is the US-made VPI HW-19 MK4 with SAMA motor, AudioQuest PT9+ tonearm and Sumiko Blue Point Special Evo-III moving-coil cartridge. This is a quiet, precision turntable with superior damping, isolation, and wow/flutter of 0.08%. Your recording is clamped to its black-nitrile platter, providing outstanding damping characteristics. This turntable is available for you with the Basic, Filtered, and Filtered-Plus options. Disc Diameter: The HW-19 accepts up to 14" micro-groove discs. Modern discs and LP's manufactured after 1948 are typically microgroove. 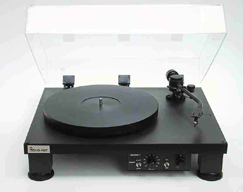 The Rondine 3 from Esoteric Sound is our new '78' recording turntable. This provides speed flexibility to accommodate the varied mastering speeds used in vintage recordings. Its rotation is controlled by its own internal microprocessor and DC drive motor. Interchangeable headshells provide the Stanton 500E-MKII moving-magnet cartridge and Stanton's complete set of 78 stylii. The stylii are custom-made ellipticals, with widths between 2.0 and 8.0 mils. These stylii provide excellent sound reproduction with all 78's, including early Pathe (vertical) disks and acetate home disks. The Re-Equalizer from Esoteric Sound is used with most pre-1954 recordings to restore the low and high frequencies lost through equalization practiced before RIAA standards were adopted. This turntable is available for you with the Basic, Filtered, and Filtered-Plus options. Disc Diameter: The Rondine 3 accepts up to 17" discs of all types, including broadcast transcription discs, at all rotation speeds between 16 and 95-rpm. "The Dragon" - The Nakamichi DR-10 is our cassette tape project machine. If you've never heard a Nakamichi before, you're in for a surprise: You'll hear sound from your tape that you may not have known existed. The DR-10 features 3 dedicated heads (record, playback, erase), with separate capstan and reel drive motors. Featuring support for Type I, II, and IV tapes, the DR-10 also supports tapes recorded with Dolby B and C noise reductions. With a Wow-and-Flutter rating of less than 0.035% RMS, the DR-10 is the most impressive-sounding deck we've ever heard. 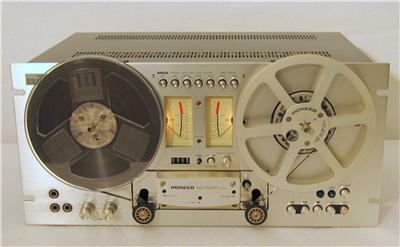 The Pioneer RT-707 is our 1/2-inch reel tape project machine. Superbly designed for studio use, this machine will accommodate your domestic tape reels up to 7-inches diameter. Tape speeds of 3-3/4 and 7-1/2 inches-per-second (9.5 and 19 centimeters-per-second) are directly compatible. If your tapes were recorded at other tape speeds, such as 15/32, 1-7/8, or 15 inches-per second, these can be time-converted digitally. The RT-707 features 4 dedicated heads (record, playback forward, playback reverse, erase), with separate capstan and reel drive motors, and supports bias and equalization for standard or LH tapes. The Edison Voicewriter is our project machine for red, vinyl Edison Diamond discs. These discs were used for voice dictation in the 1950's. The HHB 830 is our professional CD recorder for projects that require a CD suitable for a mastering source. Special 1X HHB Gold CD-R's are recorded here in real time.